French President Emmanuel Macron was forced to make two quick changes to his cabinet Tuesday after a second popular minister resigned in a week, the latest setback as the centrist leader battles record-low ratings. Macron was already seeking a replacement for environment minister Nicolas Hulot, whose shock decision to quit last week caught France's political establishment off guard. Hulot, a star TV presenter who enjoyed the highest ratings of any in Macron's cabinet, accused the president of not moving fast enough on key green pledges, including France's reliance on nuclear energy. His resignation was a blow for Macron, who famously responded to US President Donald Trump's withdrawal from the 2015 Paris climate deal with a pledge to "make our planet great again". His office announced that parliament speaker Francois de Rugy, a former Greens party member who jumped ship to Macron's Republic on the Move party last year, would fill Hulot's shoes. Rugy got a cautious welcome from environmental advocates. "He has a history of commitment to the environment, particularly with his anti-nuclear stance. The fear is that without any change on the part of Emmanuel Macron or (Prime Minister Edouard Philippe) there is little chance Francois de Rugy will do any better than Nicolas Hulot", said Jean-Francois Julliard, the head of Greenpeace France. Earlier Tuesday, Sports Minister Laura Flessel, a popular fencing champion overseeing preparations for the 2024 Olympics in Paris, also stepped down. Unlike Hulot, Flessel cited "personal reasons" for her decision, with a source close to the minister denying any link to tensions over state funding for the Games. She will be replaced by Roxana Maracineanu, a silver medalist in backstroke at the 2000 Summer Olympics in Sydney. The cabinet shuffle -- which maintains Macron's pledge for an equal number of men and women -- comes as he attempts to rebound from his lowest approval ratings since taking office in May 2017. An Ifop poll Tuesday showed his ratings at just 31 percent, down 10 points since July. His popularity had already taken a hit before the holidays after one of his top security aides was caught on film roughing up protesters while wearing a police helmet during a Paris demonstration. "The government has been on the defensive since the summer, it's no longer on the offensive," Ifop analyst Jerome Fourquet said. "It's like riding a bike -- when you stop pedalling, you fall over." Stephane Rozes, professor at Sciences Po university and president of CAP consultancy, agreed that "the Macron dynamic has stagnated somewhat". Adding to the sense of a government experiencing growing pains, Macron appears to be having doubts about a key reform to the way taxes are collected. The government has pledged to follow the example of most European countries by collecting income tax from workers at source starting in January, instead of waiting for them to file their own tax declarations. 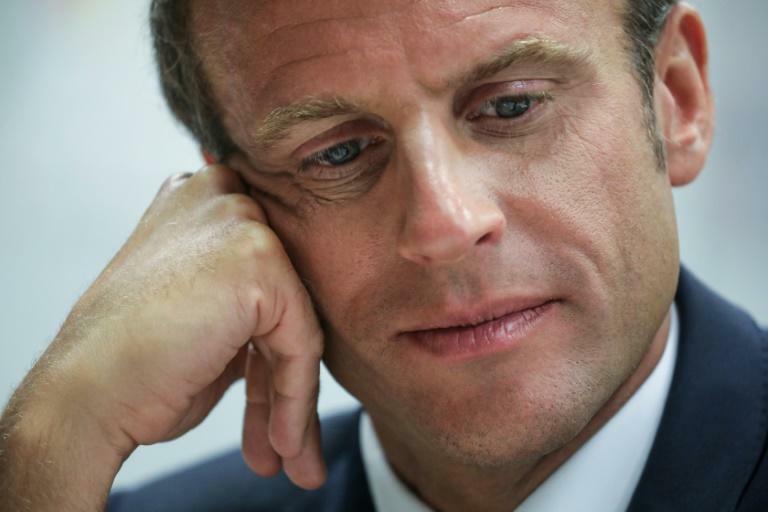 The change has been in the works for years but Macron now appears to be having second thoughts, saying he wants to ensure that all the kinks in the new system -- reported to have foundered badly in tests -- are ironed out before it is brought in. Business leaders, whom Macron has pledged to help by slimming down regulations, have criticised the reform which could cost companies a total of 310 million to 420 million euros ($360 million to $490 million) to implement. Analysts say that former banker Macron, who has promised to boost purchasing power, may also be loathe to be responsible for a drop in workers' net salaries on their payslips -- even if the amount of tax they pay remains unchanged at the end of the day. Macron's office said he would announce his decision on the new system by the end of Tuesday, after talks with Budget Minister Gerald Darmanin and Prime Minister Edouard Philippe.